It has been an incredible year for major wildfires and hurricanes both blamed on climate change, in my part of the world, Holland, it has been a warm year but...It started raining in August and it hasn't stopped, well that's an exaggeration but it has been unusually wet for the last 5 months. In the summer for the first time I can remember we had heatwaves in the US the UK and Europe simultaneously. Incredible temperatures where recorded in Arizona and Southern California of 50 deg C, 122 deg F, too hot for commercial flights to land or take off. Arctic and Antarctic sea ice coverage remain at near-record lows, surprise surprise, however, no mention snowfalls atop an Alaskan mountain range has doubled since the start of the industrial age, evidence that climate change can trigger major increases in regional precipitation, according to research published in the journal Scientific Reports last Tuesday. Below are the main highlights of NOAA's report. December 18, 2017, with a warm start to the year and only one month remaining, the globe remains on track to go down as the third warmest year in the 138-year climate record. The average global temperature in November 2017 was 1.35 degrees F above the 20th-century average of 55.2 degrees, according to scientists from NOAA’s National Centers for Environmental Information. This average temperature tied 2016 as the fifth highest for November in the 1880-2017 record. This marked the 41st consecutive November and the 395th consecutive month with temperatures above the 20th-century average. The end of November marks the end of the fall season for the Northern Hemisphere and spring for the Southern Hemisphere. 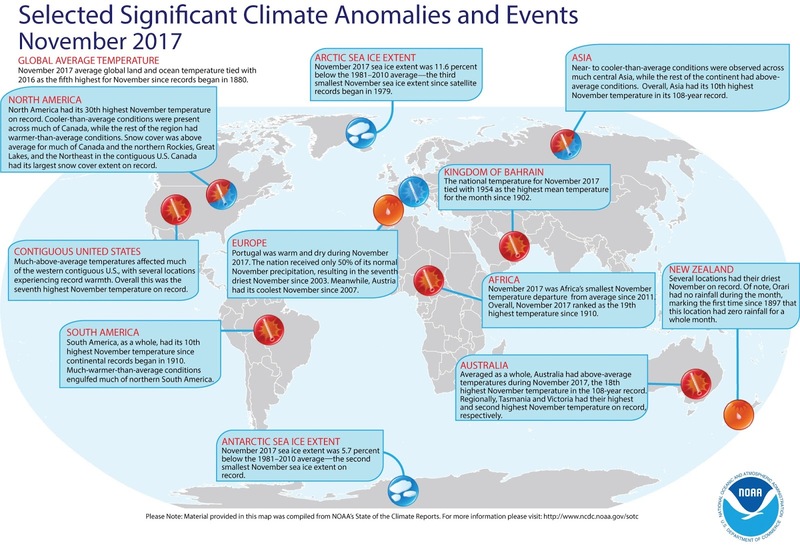 The average seasonal temperature for the globe was 1.35 degrees F above the 20th century average of 57.1 degrees F.
This was the fourth highest for September-November in the 1880-2017 record. The year-to-date average temperature was 1.51 degrees F above the 20th-century average of 57.2 degrees. This was the third warmest for this period on record.